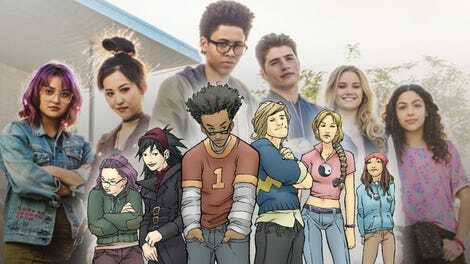 Does Runaways Work on TV? The first three episodes of the live action series Runaways have premiered on Hulu. After seeing all three, I’m still wondering if Brian K. Vaughan and Adrian Alphona’s comic book series works on TV. Evidence suggests it doesn’t. There have been alterations and additions to the story, marbling what used to be lean, precisely cut meat. The PRIDE was a group of supervillains from a variety of backgrounds: Time Travelers, Mad Scientists, aliens(! ), mutants, and wizards were all in the mix. Their methods and motives were clear: Murder an innocent every year in a ritual sacrifice and receive power and success in return. Said power and success were a gift from a trio of gods called the Gibborim. All this was laid out plainly in a handful of chapters. The stakes were clear. The PRIDE was evil. While they loved their kids, they were strongly lacking in other redeeming qualities. This was all fine. On the other hand, we have hormonal, irritable, conflicted teens who (mostly) shared their parents’ gifts. When they caught their folks red-handed in the middle of a sacrifice, they freaked out and they ran. ‘Our parents are supervillains, let’s cheese it’ is a simple and elegant pitch for a comic book story. And while it’s true that the teens didn’t flee immediately, they wasted no time working out the truth and deciding as a group to run. Hulu’s series has muddied the waters. The PRIDE are now anti-villains who try and fail to kill the sacrifice with a group hug, rather than a trusty dagger. They hem and haw over what to do and how they do it. They fall short of ruthlessness, a requirement of supervillainy. The series has also divided the PRIDE, in that spouses don’t necessarily know or approve of what their husbands or wives are up to. Part of what made the evil team function so well was that it was a team of six partnerships. That’s been lost. The motive for the ritual has also changed. The sacrifice is apparently to transfer vitality to a bedridden man. He could be an alien, he could just have terrible skin. We know nothing about him. Our villains are eager to get out of the ritual and hope each time will be the last. All this time spent on making our villains look sympathetic is time taken away from our protagonists, the kids. They work best as an ensemble, but we haven’t seen them do that yet. It’s been three episodes and we’ve gotten almost nowhere. What made the comic work so well was the concept of unruly super-teens breaking the law and trying to make it on their own without adult supervision. They were Runaways. Three hours into a ten-hour series and our title characters haven’t run anywhere. Each scene needs to move the story forward or teach us about the characters. Hopefully both. Half of what we’ve seen so far in Runaways has developed villains we don’t need to invest in. They’re not as important as the good guys. It’s their show. To their credit, the kids have been well-developed. They have distinct personalities, they want different things. They want things! That’s important in getting us to care about them. But time spent away from them is time lost. The first three episodes of Runaways have introduced some lively characters, but we still don’t know enough about heroes and too much about our villains. They have seven hours left to throw things into high gear. Hopefully, at some point soon, our Runaways will start running.